While millions of satisfied customers are reaping the benefits of solar, there is still plenty of bad information out there keeping people in the dark. Don't let bad information stop you from turning Arizona's most abundant natural resource into real savings. Click on some of the most common myths below and get the truth about solar and how it can put money back into your household budget every month from day one! Myth 1: The utilities are trying to kill solar, so I should avoid the uncertainty all together. Fact: How and when people use electricity is evolving. This is driven in part by rooftop solar, but other factors such electric vehicles, improvements in energy efficiency, and a growing at-home workforce are all having a measurable impact. To address these changes, Arizona utilities are moving toward different rate structures as a way to better align grid performance with evolving consumption patterns. Amidst all this, solar has never been healthier in Arizona. In fact, most utilities see solar as a critical component of a 21st-century energy model. Many of the new rate plans include MORE ways to save for people who are willing to engage with their own energy use through technologies like solar and demand management. While some of these plans change how solar savings are calculated, and how solar energy systems are designed, the net result remains the same: going solar is still the shortest path to cheaper electricity and true energy independence. Read more on our blog here! Myth 2: Solar panels keep getting cheaper, so I should just wait and pay less down the road. Fact: While it’s true that solar panels panel prices are getting cheaper, there are actually several other factors that have a much larger impact on the cost of going solar. Currently there are state and federal tax incentives that can offset more than 30% of a solar purchase. These tax credits will begin decreasing at the end of this year, and expire at the end of 2021. So if you're waiting to save five or ten percent on panel pricing, you could be letting a 30% tax incentive pass you by. Learn more here! Myth 3: My winter electric bills are cheap, so it's better to wait until summer to install solar. Fact: Going solar in fall or winter can dramatically improve the financial return on your solar investment in the first year. This is because most Arizona utilities support some sort of energy credit program that allows solar customers to feed excess solar electricity back into the grid in exchange for energy credits. These credits can help to further offset higher spring and summer bills. Installing solar in the fall or winter when your AC isn't working as hard (or at all) offers the greatest potential to generate extra solar electricity. Read more on our blog here! Myth 4: My roof isn't ideal for solar because it doesn't face south. Fact: While an unobstructed south-facing roof is ideal for capturing the most mid-afternoon sun, a west-facing orientation is typically best at offsetting utility power during high-demand on-peak hours later in the day (such as the 3-6 PM block) when most people are returning home from work. Ultimately, the best performing solar energy system is designed to address your specific usage patterns rather than just roof orientation. Typical considerations include utility offset goals, personal usage patterns, local utility on-peak/off-peak price pricing, and even incentive programs. All of these variables will influence the configuration, orientation, and price of your solar energy system. 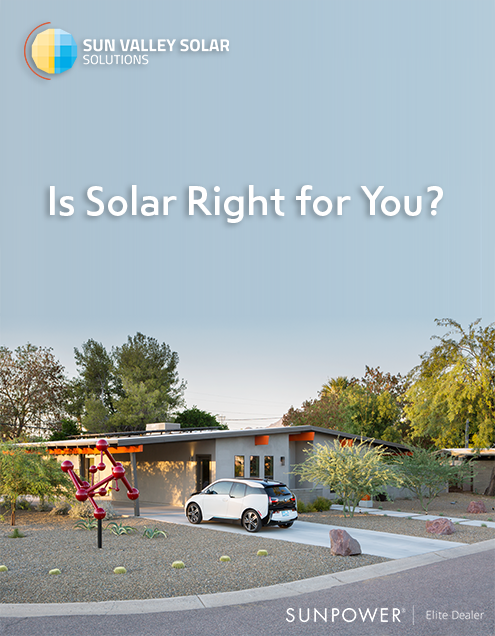 "Is Solar Right for You?